Preheat the oven to 180°C/350°F. For the base, place diced, cold butter, sugar, milk, and a pinch of salt into a standing mixer or mix with a hand mixer. Next, add the flour and knead into the mixture. Then knead the dough smooth by hand, wrap it in plastic wrap, and leave it to cool. In the meantime, zest one lime and juice all of the limes. 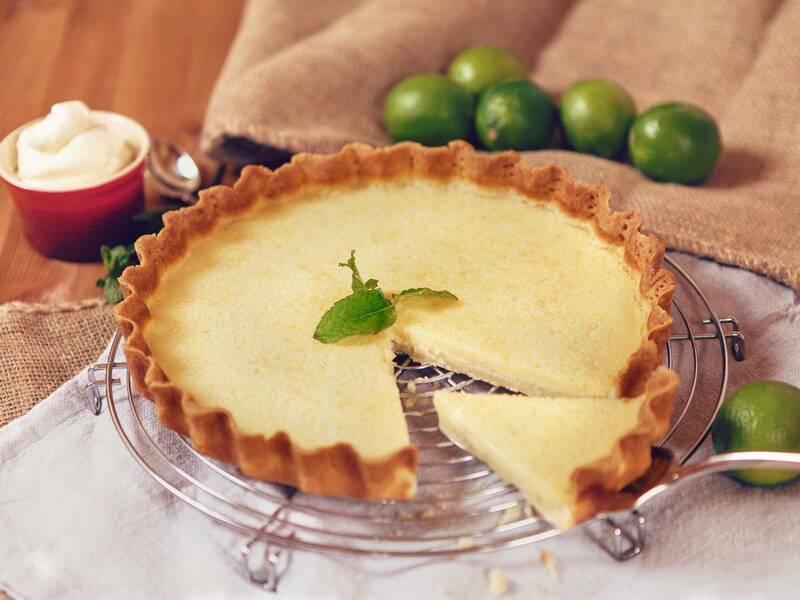 In a large bowl, whisk the crème fraîche together with sugar, eggs, lime zest, and lime juice until frothy. Roll the dough to 0.3 cm thin and lay it into a tart dish, leaving an edge. Put some parchment paper over it, weigh it down with baking beans, and blind bake in a preheated oven at 180°C/350°F for approx. 12 - 15 min. Then, let cool for approx. 10 - 15 min. Pour the filling onto the cooled base and bake in a preheated oven at 170°C /338°F for approx. 30 - 35 min. Leave the tart to cool down, then chill for approx. 1 - 2 hours. Serve with a garnish of fresh mint.